"A great trouble requires a great leader." If Regis were to ask you for a great Russian director, the name Sergei Eisenstein would be the natural one to come to mind. Not only the most prominent Russian director, he was one of the greatest artists of the cinema to date. Making his reputation with the silent epics Battleship Potemkin, Strike and October, he had an long string of bad luck in entering the sound era. First came a trip to Hollywood that ended in the disappointment of not being able to film his script of Dreiser's American Tragedy (for which I will NEVER forgive David O. Selznick, who vetoed the film). Then the inability to complete ��Que Viva Mexico!, and the studio's seizure of the footage shot and a complete recutting that disregarded Eisenstein's ideas. When he returned to Russia to make Bezhin Meadow, that film was denounced and destroyed. This left Eisenstein at a completely low ebb, out of favor and in danger of being forgotten, if not imprisoned. But at the same time, Russian composer Sergei Prokofiev was at a similar low ebb in his fortunes; none of his compositions had been published for years, and he, too, was rejected by the Stalinist regime as out of step with the communist reformation of the nation. Yet these two set about a collaboration which would produce three of the most striking films of the sound era, the resounding triumph of Alexander Nevsky and the first two parts of the Ivan the Terrible trilogy, which was never completed. These only completed sound films of Eisenstein are presented here in this new Criterion set. "Defend? I do not know how to defend. We shall smite them with all our power!" Nevsky is, in this reviewer's opinion, one of the most sublime marriages of film and music ever to have been created. Eisenstein was selected to make a propaganda film to arouse the Russians against the dangerous expansionist tendencies of the Germans under Hitler, and the 13th century defeat of the German Teutonic Lakes by the title hero seemed to be a suitable method for doing so. Playing the title role in this, as well as the other two films, is the excellent Nikolai Cherkasov, who was something of the Russian equivalent of Charlton Heston. With a commanding voice and presence, he brings these characters to life with gusto and humor. Having defeated the invading Swedes on the Neva river two years earlier, Alexander Nevsky is asked to come to the aid of Novgorod, the last free Russian city-state. In the nearby city of Pskov, the Teutons are depicted as laying waste to the city and its people, butchering men and women and burning infants alive, all in the name of the church in Rome. The religious fanaticism forms a key part of Eisenstein's criticism, which is not directly paralleled to the Nazi menace, but which is effective nonetheless in evoking Russian nationalism. After a disastrous initial skirmish, the film climaxes in an unforgettable half-hour long battle on a frozen lake. Winding up the story is a lengthy coda of the losses suffered by the Russians and Nevsky's moderation and humanism in dealing with the foe, in sharp contrast to the evil of the Teutonic Knights. Prokofiev's score is nothing short of marvelous; he captures the essence of Russian folksongs in his faux melodies, generates an incredibly exciting track to underlie the battle sequence, and gives a haunting and anguish-filled soprano solo over the identification of the dead afterwards. Also noteworthy are the ominous themes devoted to the knights and the atonal mockery of Gregorian chant assigned to the bishop and priests accompanying the Germans. Moving in the extreme, Prokofiev's music lifts this far above a mere propaganda film and into the stratosphere of perfect cinema. Eisenstein is less reliant on montage here, but in the battle sequence he effectively uses it to generate excitment, continuously cutting the shots ever shorter until they are deep into music-video territory. The highly stylized costumes are carefully designed to make the Teutonic Knights and their footmen seem to be inhuman robots; this was a theme that George Lucas would pick up in Star Wars, as well as the imagery of the Emperor, who is clearly derived from the evil black-robed monk who plays the organ for the Germans. The resemblance between the iron helmets of the footmen and the metal helmets of the Nazis is certainly not coincidental. One of the best movies ever made, Alexander Nevsky gets my absolutely highest recommendation. "From now on I will be just what you say I am. I WILL BE TERRIBLE!" 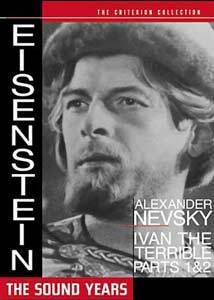 Stalin was justifiably thrilled with Nevksy, and decided that Eisenstein's next project should be another historical epic, this time based on the life of 16th-century Tsar Ivan IV, or the Terrible, who unified the Russian state. Stalin's choice was somewhat odd, since he intended to use the character of Ivan as a justification for his own despotic rule, but apparently didn't quite comprehend exactly how badly the cruelty of Ivan would come across in the later parts of the film. Conceived as a trilogy, Eisenstein only completed the first two parts before his death in 1948. The first part won a Stalin prize, but the second, which showed the increasing ruthlessness of the Tsar, led to the banning of the film until 1958, long after Stalin's death (as well as Eisenstein's). Although about four reels of Part III were completed, most of it was destroyed in the third great tragedy of Eisenstein's career. The film opens with the coronation of Ivan as Tsar, and his determination to unify the various Russian states, which were ruled by nobles called boyars. The life of Ivan was spent in struggles against the plotting of the boyars and his efforts to make them submit to his will. The first part centers on how Ivan consolidated his power into absolute rule, and demonstrates that the peasantry had great affection for him, apparently preferring him to the chaos of the boyar rule. The second part concerns a plot by the boyars (led by Ivan's aunt Efrosinia (Serafima Birman)) to assassinate Ivan and put his half-wit and easily controllable cousin Vladimir (Pavel Kadochnikov) on the throne instead. At the same time, Ivan is forming the Oprichniki, his own secret police (a factor which no doubt contributed to Stalin's ire) and his Machiavellian scheme to turn the boyars' plot against them. Cherkasov is again terrific here, effortlessly moving from the young Tsar to the middle-aged Ivan, aided by extreme makeup which emphasizes his hawklike character. Serafima Birman is also unforgettable as the wicked aunt who poisons Ivan's wife and then tries to replace him on the throne with her son. Also noteworthy is Erik Pryryev, as the young Ivan. Not only does he closely resemble Cherkasov, but he is quite an accomplished young actor who gives a sensitive portrayal of the terrified orphan who is bullied and humiliated by the boyars. Eisenstein intentionally returned to the techniques of silent film here, with extreme gestures and highly expressionistic lighting. Prokofiev's music is again in evidence, though more subtly than in Nevsky. There are highly effective moments, however, such as the wailing clarinet that accompanies the plotting of the boyars. Eisenstein's attention to detail comes into full flower in Ivan, from the incredibly sumptuous costuming to the detailed frescoes on the wall, to the repeated imagery and body language which forms a comment on the action and draws parallels that might not be seen otherwise. Oddly enough, despite his intimate connection with montage, Eisenstein hardly uses it at all in his last film, preferring instead to rely on religious imagery and the lighting to make the comments that would otherwise have been made by juxtaposition of shots. As the supplements make clear, this is a film of a great many layers which rewards repeated viewings. Image Transfer Review: All three films are transferred from fine-grain positives, and show excellent detail and texture. Black levels are very good, and only in a very few scenes is there too much contrast. Alexander Nevsky is in variable condition. Some shots are in excellent condition, but much of the source material is in appallingly bad condition. Speckles, spots, dirt, rips, tears and appalling flicker abound throughout, especially in the key sequences of the carnage at Pskov and the Battle on the Lake. A close examination of the restoration demonstration, however makes it clear that something is not quite right. Whereas the restored "after" shots in the demo are quite excellent indeed, many of the "before" clips correspond to the film as it is presented on the disc! We are currently in discussions with Criterion to determine what the reason for this discrepancy might be, and will report back. Ivan the Terrible, on the other hand looks quite good for the most part. There is occasional speckling, but nowhere near the level of film damage that is seen in Nevsky. There are several color sequences in the conclusion of Part Two (the result of Agfa color film being liberated from Germany and supplied to Eisenstein) which are very red in nature. Our research* indicates with near certainty that this heavy emphasis on red was intentional on Eisenstein's part, and is not a defect in the film or in the transfer. In this respect, it is much superior to the transfer of the Image DVD of Part Two, which has more naturalistic color. The black and white segments of the Criterion disc are also much superior to the Image version of the film, which by comparison is blurry and lacks detail. The Image disc also suffers from occasional cropping that distorts Eisenstein's visual artistry. Our review as originally posted heavily criticized Criterion's transfer of the color segments, and we stand corrected on this point. Viewers new to the film will in any event want to remember that the unusual appearance of the color is in fact intentional. Nevsky gets a D for image quality; Ivan ranks about a B.
Taylor, Richard The Eisenstein Reader London: British Film Institute (1998) 174-179. Audio Transfer Review: Andre Previn once described Alexander Nevsky as having both the greatest film score in the world and the worst soundtrack in the world. Because Stalin refused to permit modern sound equipment to be imported into the USSR, Eisenstein and Prokofiev were terribly hobbled in their sound design. When you add to that the fact that the music is apparently only a rehearsal track which never was intended to serve as the final audio, you have a recipe for disaster. Nevsky has never sounded good, and probably never will. Criterion does a decent job with the audio here, making much of the music quite listenable; when the dialogue comes up there is inescapable crackle and hiss, but it is much minimized below other incarnations of this movie, both on film and video. There's not much to work with here, and Criterion has done a very good job of coaxing out what little quality there is. Ivan the Terrible has a marginally better soundtrack, and is given a decent presentation. There is hiss throughout, but nowhere near as bad as that in Nevsky, and it is slightly superior to that on the Image discs. It is certainly tolerable for a Russian film of its vintage. On absolute terms, these films would get an audio grade of D- and C+ respectively; the higher grade reflects the disastrous state of the original audio materials. Extras Review: It is in the department of extras that this Criterion set truly blows the old Image barebones discs of these movies out of the water. First is an insightful commentary on Nevsky that comments on the photography, the costuming, settings, acting and music, as well as the structure of the film. A 23m:13s audio essay on the score by Russell Merritt includes copious examples and clips as well as additional materials to further document the score. 62 production drawings and stills are included, as is a demonstration of the supposed restoration. One of the key extras on this disc is a brief reconstruction of the destroyed Bezhin Meadow, a tale of a Stalinist Young Pioneer murdered by his father for informing on him, set against the struggles for agricultural collectivization. This reconstruction was possible because Eisenstein kept, as souvenirs, the first two and last two frames of each of his films; his wife retained and preserved them after his death until they were assembled into this piece of work. It's difficult to assess this film from the reconstruction, but at least we have a glimpse of what Eisenstein intended to show. Accompanying this are 57 behind-the-scenes photos and six essays by Eisenstein and others on Bezhin Meadow. The Eisenstein essays in particular make for a fascinating picture of what filmmaking was like under the thumb of Stalin, with the filmmaker being reduced to criticism and denunciation of his own work. The Ivan discs are a little less lavish, but are fascinating as well. First up is a lengthy (37m:41s) audio essay on Stalinism and the making of Ivan, and a second visual essay on the imagery used by Eisenstein in the film. The latter (33m:44s) is in particular penetrating and valuable; it ranks among the best documentaries on a film that I've ever run across. The level of detail and parallels of imagery, as well as their sources, are set forth here and make the viewing of Ivan a much more rewarding experience. Although I typically don't assign an A grade to a DVD that lacks a commentary, the excellent content of these documentaries makes all the difference. One hundred and seven production drawings and stills are included, but the real prize is over half an hour of deleted scenes. The first, and lengthiest, is the deleted prologue of Ivan as a child which was cut from part one (small segments were later used in Part Two). I don't understand why the state censors required its removal, as I find hardly anything here that would have been likely to offend even the paranoid Stalin. It also gives a sensible explanation for Ivan's hatred of the boyars and makes for an excellent transition to the coronation sequence which now opens part one. An inconsequential pair of segments cut from the Battle of Kazan is included as well. Astonishingly, we also get two brief scenes that somehow managed to survive from the wreckage of what was to be Part Three, where Ivan descends into complete madness and utter cruelty. The first of these is a silent sequence of the English Queen Elizabeth I (portrayed by the male head of the Film Union; his participation was nixed by the officials of that group). The second is a nightmarish segment involving Ivan's torture chamber interrogation of a German knight (briefly glimpsed in Part Two), Heinrich Staden. The expressionist lighting is even more radically bizarre here, and this serves as an agonizingly tantalizing peek at what was not to be. The only thing I can imagine that might have made this set even better would have been the inclusion of the screenplay for Part Three. That omission lowers the grade from an exceptional A+ to a highly respectable A. Two (or three) of the greatest films ever made, with wonderful extras that will keep you busy for hours upon hours. The audio is probably as good as can be managed from these pictures, but the video transfer of Nevsky is sadly nowhere near what one would hope. Check back for more information on this transfer as we continue to explore whether this is in fact the best that can be managed from the original materials. Ivan the Terrible without a doubt looks like it will be the definitive edition for many years to come.